Do you have a persistently runny nose, sneezing, and post nasal drip? If you have these symptoms or a frequently runny and stuffy nose, you may have Chronic Rhinitis (CR). Surgical treatment options can be too invasive. Sprays, drops and oral medications may provide some relief, but you may want a solution that lasts longer without the side effects of medications. Now, you have a new and better option for treatment. ClariFix® Cryotherapy is the breakthrough cooling technology to give you effective, long-term relief from chronic rhinitis. ClariFix® treats the root of the CR problem: the inflamed nasal tissue itself and the underlying nerves. It has been established that interrupting the pathways of nasal nerves results in the reduction of runny and stuffy nose symptoms. Cryotherapy has been used since the time of the ancient Egyptians. The beginning development of modern cryotherapy dates back to around 1961. Since then, cryotherapy has been well established in medical literature as safe for soft tissue and nerve ablation (tissue removal). Arrinex, Inc., the makers of the ClariFix® device chose cryotherapy to treat patients with CR because of its favorable safety profile. Another important aspect of cryotherapy technique is that the process of freezing preserves connective tissues that serve as scaffolding for tissue repair which contributes to good tissue healing after the procedure. With the well-established properties of cryotherapy, ClariFix® allows Dr. Weiss to interrupt the neural pathways triggering rhinitis symptoms without damaging surrounding nasal structures. Treatment with the ClariFix® device provides a safe, effective, and durable solution for his patients. ClariFix® Cryotherapy is performed in our office. Only local or topical anesthesia is needed, so you can go back to your normal activity right away. 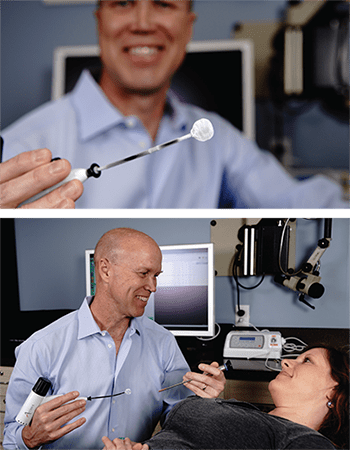 Dr. Weiss will use the special ClariFix® cooling probe to freeze a small area of nasal tissue in the back of your nose. The cooling time takes just a few minutes. Are you still suffering with chronic rhinitis symptoms even after all the medications you’ve tried? Contact us today to set up your evaluation for ClariFix®Cryotherapy.